Tuesday, Feb 11, 10:00 to 11:00 am, Edgartown. Join Felix Neck for a winter walk to discover what's happening in nature during the Sanctuary's off season. Warm up afterward with a hot beverage. $5, free for members. For more info, call (508) 627-4850 or see website. Wednesday, Feb 12 at 7:00 pm, Edgartown. "Genetic Roulette: The Gamble of Our Lives" showing at the Edgartown Library. Presented by Slow Food M.V. For more info, call (508) 627-4221. Saturday, Feb 15 at 1:00 pm, at the MV Reg. High School. Visit birding hot spots with your guide Robert Culbert. Carpool will depart from the high school faculty parking lot at 1:00. Cost is $30 per adult, $15 for under 18. For details call (508) 693-4908. Saturday, Feb 22, 1:00 to 4:00 pm. Two programs on opposite ends of the island to help burnish your scouting skills -- too bad you can't do both! At Sassafras Earth Education in Aquinnah, learn the Art of Tracking in snow or sand. $25 per person, RSVP rec'd. Call (508) 645-2008 for more info. Or, head to Felix Neck for the Skull and Bones workshop, which is exactly what it sounds like. $30 ($25 for members), registration required. Call (508) 627-4850 or see website for more info. Free gently worn clothing at the Christ United Methodist Church (Stone Church). Re-use beats recycling any day. For more info, call (508) 693-4424. Winter hiking at Five Corners? 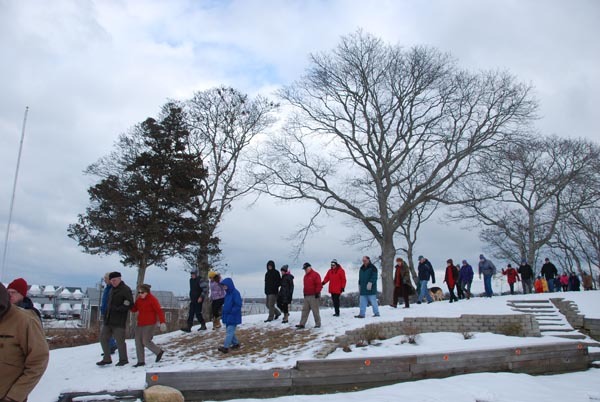 On Feb. 9, 2014 an intrepid group of more than 40 walkers participated in the VCS "Lost Bass Creek" exploration, setting out from the post office parking lot near Five Corners in Vineyard Haven. As part of this year’s “Living at Sea Level” series, the walk used vintage photographs, maps (present and past; also see here), and first-hand accounts to dramatically illustrate the pervasive nature of change, and how it can sometimes occur over short periods of time. Echoing the theme of earlier walks, it emphasized the critical importance of planning for the climate change impacts already underway on our Island. 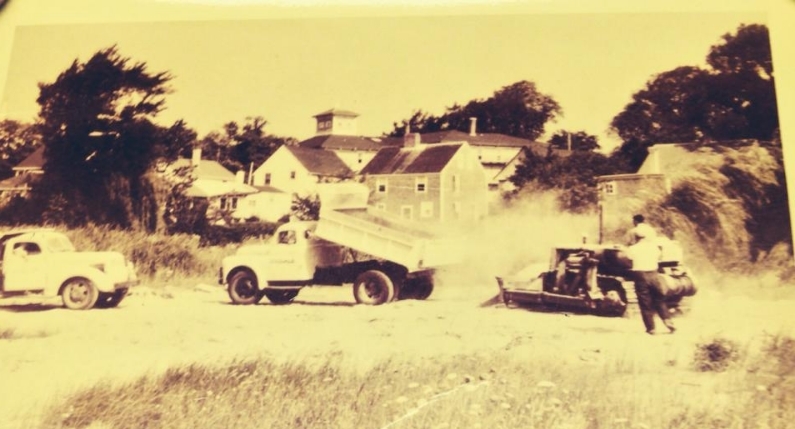 A complex barrier beach and estuarine system once existed in the area of Five Corners and the flat expanse of the Legion Veteran’s Memorial Park behind the post office. 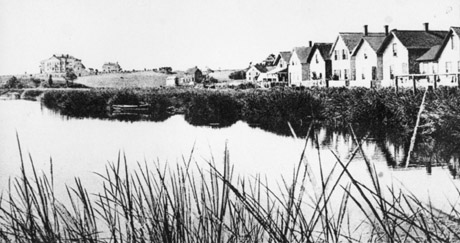 Two hundred years ago, sailing vessels of all kinds entered the Lagoon Pond through the Bass Creek. A navigable waterway of 6 - 7 feet in depth emerged through an opening in the barrier beach near the present location of the Steamship Authority parking lot. It formed a curving arc past the present Stop & Shop and Five Corners locations, widening into the Bass Creek. In September of 1778, more than 4,000 British troops and dozens of warships moored in the harbor and forcibly re-provisioned their ships. More than 10,000 sheep, 300 oxen, and all manner of goods and possessions left with them. That winter was particularly harsh on the Island, and there are accounts of the impoverished town residents cutting bass from the frozen Bass Creek. The walk at Bass Creek explored a very specific example of very deliberate alteration to our natural environment. Of course, the world around us is always changing, sometimes with human assistance and sometimes on its own. Today we present three compelling visualizations of environmental change. First, a look at Google’s Earth Engine, for a time-lapse series of satellite photos of our Island. With this view centered on Edgartown, you can see the shrinking shoreline at Wasque and the opening and eastward migration of the cut at Norton Point. The images dating back to 1984 also reveal development impacts and other changes to the Island’s interior. You can also move the map around for a bird's-eye view of the changing landscape of the entire region. 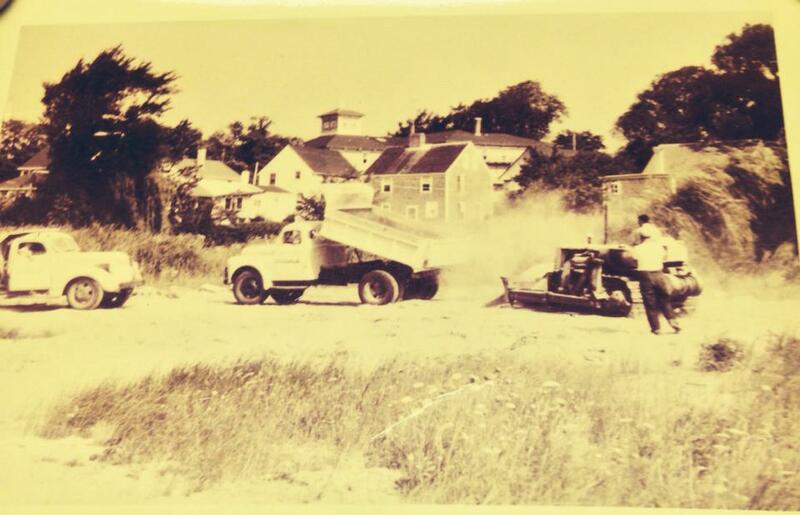 Check out, for example, the rapidly migrating beaches around Chatham on Cape Cod. Next up, a more global and ominous take on one of the contributors to this shoreline change: our rising planetary temperature. This 14-second animation from NASA depicts 60 years of climate data as one giant flowing global Lava Lamp. It’s probably best not to speculate on how the world’s climate scientists truly feel about reducing decades of complex research to this level of brevity, but it is quite the visual effect: if a short attention span is the final barrier to one’s acceptance of global warming, this should be an effective antidote. Finally, a peek into the world of trying to put it all back together again. There is no narration accompanying this footage taken by a remote control helicopter, observing the work of heavy equipment on and below Nantucket's 'Sconset Bluff. Further to that end, the simple caption for the video – Sand! We need more sand! – leaves it to the viewer to decide what kind of change we are really looking at here: slowing the rate of change, reversing change, forcing change on human terms, or creating future change through unintended consequences?